It’s fashionable these days to say things are actually the opposite of what they seem in order to shock, titillate or just stir stuff up in the name of “generating a dialogue”. Bacon is actually good for you! The Star Wars prequels are misunderstood genius! Guinea pigs are not adorable furry eggplants with legs and ice water is not a cool, refreshing beverage. Is Apple perfect at design? No. Is Apple, however, good at design and, for the most part, better than its competitors? Yes. The “notch” on the new iPhone X is not just strange, interesting, or even odd—it is bad. OK, the Macalope is not going to praise the notch, that much is certain. He’s not even going to try to excuse the notch. He thinks the notch, while maybe slightly better than the lone truck nut on the Essential phone, is still horrible. It is a little ironic, however, that The Outline has the quote “It is, put plainly, a visually disgusting element.” pulled out and bordered by the constantly moving squiggly lines that are The Outline’s own signature visually disgusting element. The justification for the notch (the new Face ID tech, which lets you unlock the device just by looking at it) could have easily been accomplished with no visual break in the display. The Macalope does not really understand why the company didn’t do this, either. Bezel-lessness for the sake of bezel-lessness is not really the design goal, of course, it’s to pack larger screens onto smaller phones. We don’t all agree, apparently, on the best way to get there. Sometimes ridiculous goals lead you someplace great, it just takes a little while. The original MacBook Air was a compromised device, chasing thinness at the expense of cost and performance. Eventually, however, it led to to the 2010 13-inch and 11-inch Airs which are some of the best and most beloved laptops Apple ever built. Maybe Apple will get someplace great with this. 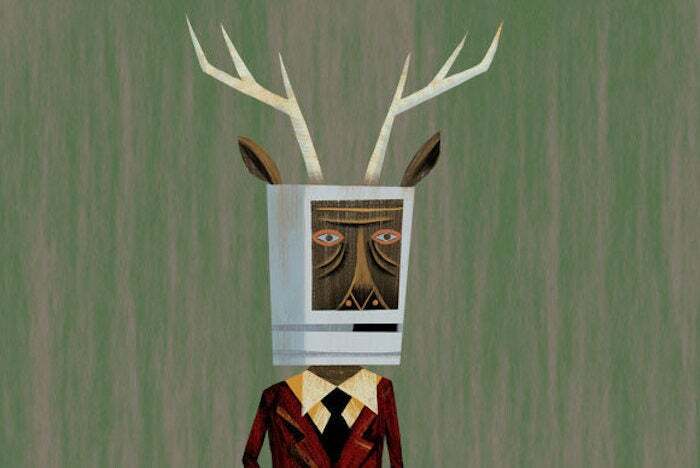 For the Macalope’s money it’s not there yet with the iPhone X. Ben Bajarin is certainly correct in saying “Realistically, whatever Apple chose would have been criticized.” The Macalope suspects going notchless would probably have been criticized less, but the replies to this tweet about the Pixel make him wonder. Now, let us stroll down Imaginary Lane and turn left on Fabrication Avenue as we reinvent a history where no one ever said anything bad about Apple design. Once upon a time, Apple could do little wrong. All was right with the Apple world and none spoke ill of the company! Kittens were plentiful and free and we all marched together, arms locked in... OK, you get the idea. No one complained about the plastic iPhone 3G, the buttonless iPod Shuffle, the cheap iPhone 5c, brushed metal, pinstripes and stoplight colors in OS X, or the “fat” iPod nano and no one ever said that the “groundbreaking” iPhone 4 was ugly. (The Memory Hole is open 24 hours a day, 7 days a week for your memory-shoving needs.) Topolsky misremembers that people only started complaining when iOS 7 was released. iOS 7 certainly wasn’t perfect, but it was a dramatic reset of the design of iOS, sometime most observers of the company agreed needed to happen. It was just another thing Apple did that people complained about. One that also evolved into something nice. When you invent fictional histories, it’s very easy to think there’s a strong disconnect between what was and what is now. Have you talked to an owner of a pair of AirPods? They are not perfect, but when they work it’s so great they make you forget the times they’re not perfect. A lot of pundits also called the original iMac just an ugly, underpowered Mac without vital ports and a floppy drive. Larger iPads. Smaller iPads. Bigger iPhones. Smaller iPhones. Apple Watch. Apple Pay. Apple Music. AirPods. Pencil. ARKit. Soon, also the HomePod. Other than those, though, yeah, all just iterative. Most of Topolsky’s individual complaints are valid. iTunes has been a mess for years and charging the Pencil in the iPad’s Lightning port is awkward. But his overall narrative that Apple’s past was perfect and its present is all garbage does not hold much water. Does Apple know what’s coming next? No, Apple is just a big, dumb baby that hasn’t learned object permanence yet. So, yeah, let’s talk about ARKit again for a minute. For several years pundits were howling about how Apple was woefully behind in virtual and augmented reality. Samsung was “miles” ahead! Apple will never catch up! Then Apple releases ARKit at WWDC and, er, well, now everyone’s going nuts for ARKit so let’s move on to the next way Apple must be screwing up because it apparently wasn’t that.